V-LINC was developed in the School of Business & Humanities of Cork Institute of Technology by Dr John Hobbs, Eoin Byrne and their research team. Across the globe regions compete to attract investment from MNCs and SMEs looking to develop units in key geographic markets. Decision makers in industry are searching for innovative regions which contain strong clusters which connect industry, academia, and government agencies. To attract investment and develop strong highly connected clusters, regions seek to develop polices which create economic growth and prosperity within their local ecosystem. Regions endeavour to invest their resources to develop strengths. However, understanding a region’s strengths, its constituent firms’ value chains, and R&D capabilities is not an easy task. Furthermore, no two regions are identical and all seek to use varying policy instruments and organisations as conduits to increase competitiveness; thus, there can be no one policy or strategy which is appropriate and fits the requirements of all regions. To develop targeted strategies to leverage a region’s strengths and promote efficient and effective use of public investment an in-depth understanding of the regions ecosystem is required. 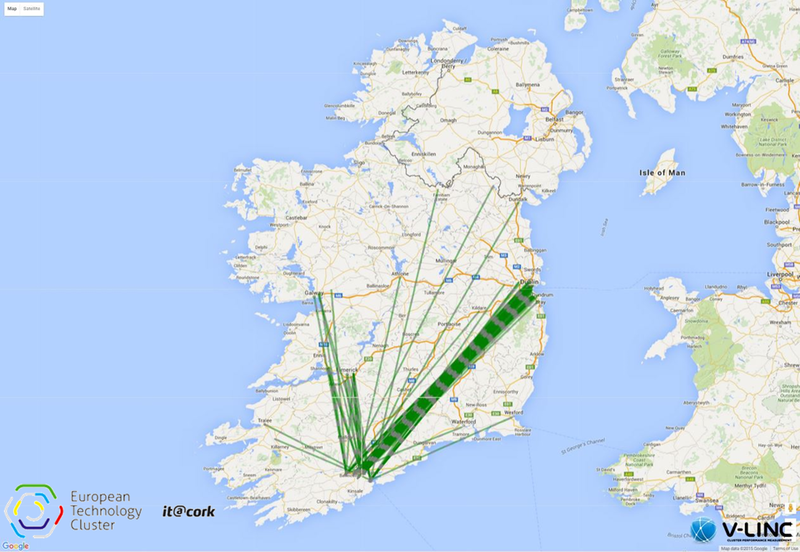 The images above showcase the output linkages from firms based within Systematic’s ICT Cluster in Paris, France and it@cork’s member firm linkages with organisations across Ireland. The V-LINC analysis is applied to specific industry sectors to help cluster organisations, regional/national development agencies and policy makers understand their region’s ecosystem through state of the art analysis. The V-LINC research team operates in partnership with cluster organisations and regional/national authorities to develop targeted strategic short, medium and long term policies for industry sectors based on regional/national strengths and capabilities. The strength of the V-LINC analysis is its ability to assess and articulate the importance of inter-firm linkages within a cluster and thus to allow policy makers develop targeted strategies to leverage a region’s strengths. 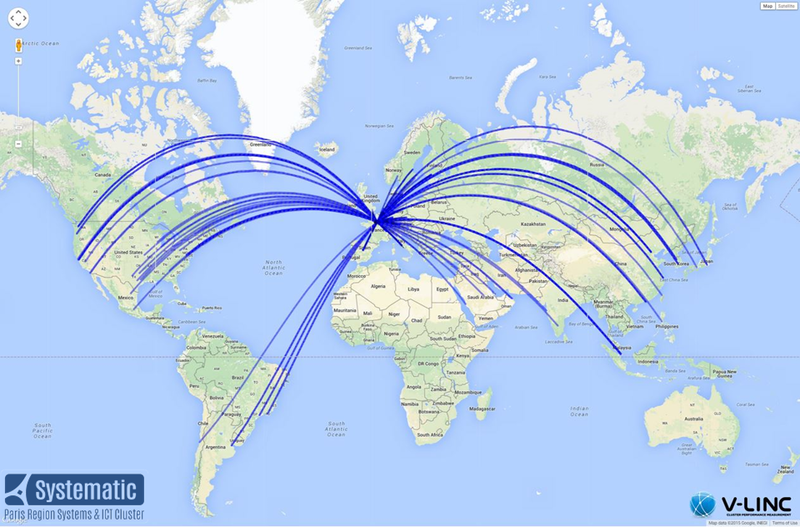 V-LINC is the only analysis globally that can map and visualise your regions key relationships, and showcase their importance regionally, nationally and internationally. V-LINC identifies the firms and organisations that are key connectors within your cluster ecosystem. These organisations can be conduits for implementing new policy initiatives across the ecosystem. V-LINC analyses engagement in areas such as research, development, innovation and training. V-LINC develops targeted policy recommendations to increase collaboration between firms (both SMEs and MNCs), increase R&D collaborations, develop internationalisation strategies and improve the value of cluster/industry organisations.